Ruben Guthrie, Directed by Brendan Cowell. Screened at the 2015 Sydney Film Festival. National cinema release 16 July. Rubeun Guthrie opened the 62nd Sydney Film Festival with a bang. The directorial debut for playwright, actor, screenwriter and novelist Brendan Cowell begins with a Moulin Rouge like explosion of music and partying. There are bikini clad women diving into a perfect swimming pool, thumping music, laughing and shouting and, above it all, the figure of Ruben Guthrie celebrating another advertising industry award by pouring bottles of french champagne over his face. This is an Australian, or to be more precise, a very Sydney decadence. Rubeun Guthrie is in advertising and has produced a series of successful campaigns, clients demand he work on their briefs. But it quickly becomes clear that it is a very insular success. Guthrie’s supermodel girlfriend/fiancée is on the verge of walking out on him and the final straw comes as he climbs onto the roof of his waterside mansion in a drunken haze and almost kills himself by misjudging a jump into his pool. There is almost a Harry Joy (Bliss – Peter Carey/Ray Lawrence) moment as the camera looks down on Guthrie lying on the bottom of his pool, his broken award just out of reach. But the gaze quickly returns to Gurthie looking up from the pool and the blurred figures looking back down at him almost appear to be seen through an alcoholic haze. On a superficial level there are some obvious similarities between Ruben Guthrie and Harry Joy. While Harry Joy was to die three times I was only about to count two metaphorical deaths for Ruben Gurthie – one when he jumps into his pool from the roof of his house and the other when he comes off the wagon later in the film and drinks himself into oblivion. Perhaps there is the possibility of a third death at the very end of the film, but it this one is left open ended as the closing credits disrupt the narrative. But while Harry Joy’s hell is the life he has been living up to the point of his first death, for Ruben it is a little more complicated. There is no sudden eureka moment when the facade comes crashing down and everything is exposed. His first reaction when confronted with the reality of a smashed arm and a supermodel girlfriend who is threatening to leave him because of his drinking is to try to work out how to open a bottle of french champagne with one arm. But things do change suddenly for Ruben, his girlfriend does leave him, giving him an ultimatum to stay off the drink for a year, and his mother makes him attend his first AA meeting. Ruben finds, however, that the impact of staying off the booze is much larger than he expected. On his return to work he finds that there is a new kid on the block biting at his heels and there is the perception that without the booze and the all night parties with clients he has lost his edge. Couple this with increasing conflict between his new friends from his support groups and his old friends that are still living life at warp speed with drugs and booze and Ruben finds himself in very unfamiliar territory. 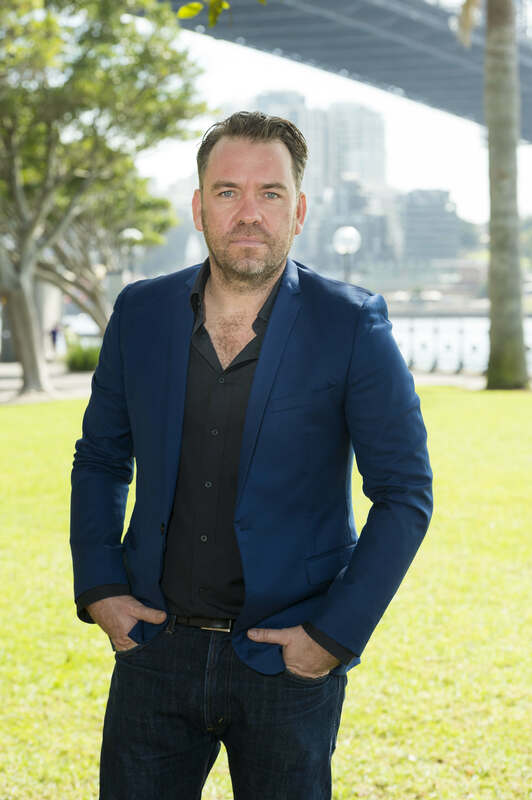 Ruben Guthrie represents the directorial debut for Brendan Cowell who also wrote the screenplay based on his successful stage play. Speaking at the recent Sydney Film Festival Cowell described how the idea for the original script came about following a “social experiment” where he gave up drinking for a year. Within weeks of this pursuit all my comforts had shifted, as well as my relationship with others, my body, and the world. It was profound, hilarious, and terrifying all at once. I lost whole friendships, started brand new ones, and most importantly saw my country, and my family and friends within it, in a whole new light. It dawned on me (in a very Wake In Fright fashion) that saying no to a drink in this country was an insult to all involved. On one level it is clear that there is a personal element to this movie, but Cowell has also distanced himself from it to a degree. The film is a further step away from the personal than the stage play, and Cowell has also decided to use the advertising industry as a background (an industry he is not personally involved in). This perhaps adds a certain detachment to the film as Guthrie moves between the two worlds, one fuelled by alcohol and the perception of success and the other full of support groups and an unfamiliar sobriety, and doesn’t feel completely at home in either of them. All the time, however, there is the light on the hill, the possibility that after a year his girlfriend will return. But it is a light that Gurthie increasing despairs at and when his girl friend does unexpectedly return his life has moved in such a direction that he nothing is immediately resolved. While Ruben Gurthie might represent Cowell’s first attempt at feature length directing, he has a long and impressive CV as a writer, actor and theatre and tv director and this experience shows through in the film. One gets the feeling Cowell appreciates the freedom that film has given him to take the original play to another level. While a strong script and tight direction provides a strong foundation for Ruben Guthrie, it is the strength of the cast that ensures the overall success of the film. 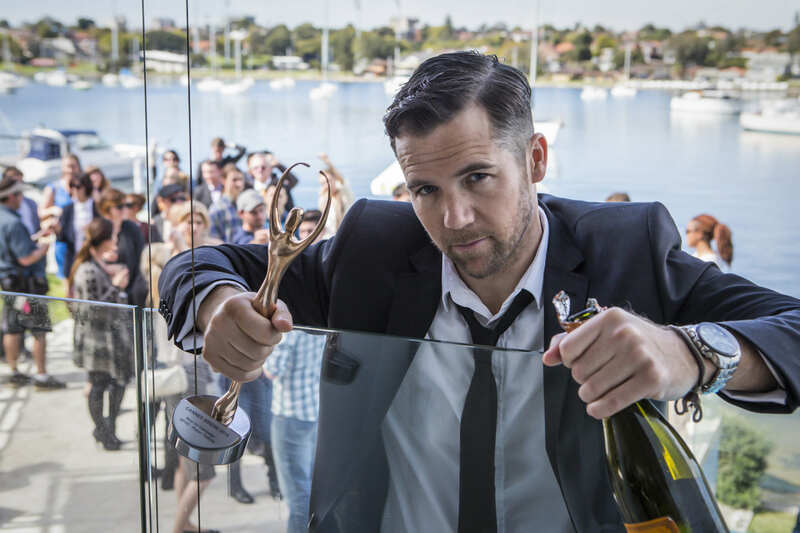 Patrick Brammall’s portrayal of Ruben Guthriue strikes the right balance between the fake confidence and camaraderie of the alcohol fuelled world of advertising. In those scenes where he is at the top of his professional game there is something seductive about his personality. We see why he is successful and we can see how alcohol is critical to maintaining that success in the world in which he living. But when Brammall rides his character over the edge, we sense his utter confusion as his private and professional lives starts falling apart. 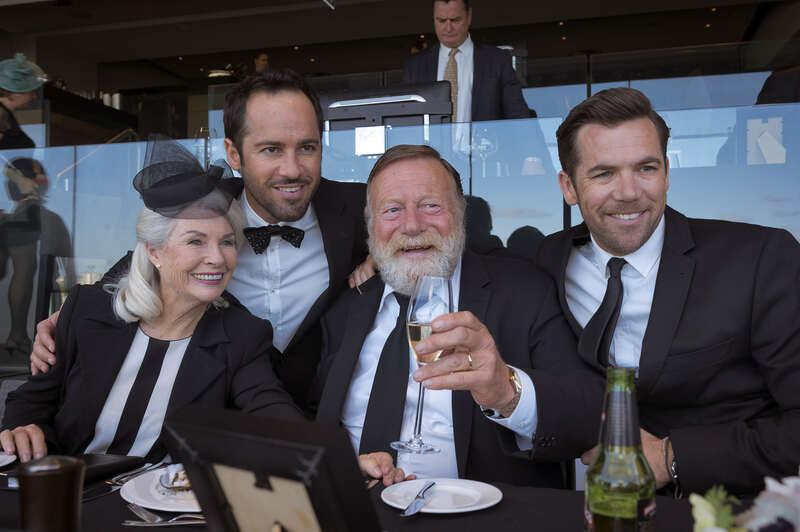 Alex Dimitriades appears to be in his element as Damian, Ruben’s drunken gay colleague who moves in with him after a failed career move overseas. While Ruben tries to stay on the rails and starts a new relationship with a woman from his support group, Damian parties on with multiple partners and pushes Ruben to make decisions over his old and emerging lives. Harriet Dyer plays a crucial role in the film as Ruben’s new and convenient love interest in the absence of Zoya, his model girlfriend, played by Abbey Lee. Dyer plays this difficult role with some skill. We are never completely sure of her motives as her relationship with Ruben develops and the tension that develops between her and Damian drives much of the tension during the middle sections of the film. One also has to also acknowledge the roles of Robyn Nevin and Jack Thompson as Ruben’s parents. Somewhat surprisingly these two actors have never performed together before and it is a real joy to watch them together in this film. Ruben Guthrie is one of a number of strong films which featured at this year’s Sydney Film Festival and along with Last Cab to Darwin, Strangerland and Holding the Man. While there is, perhaps, a the view in some circles that the golden days of Australian films are behind us, the strength of these films suggests that there is much to support and appreciate in contemporary Australian cinema. If you missed Ruben Guthrie at the SFF it is well worth catching it during its upcoming commercial release. This entry was posted in Brendan Cowell, Issue 15, Ruben Guthrie, Sydney Film Festival and tagged Abbey Lee, advertising, Alex Dimitriades, australian films, Harriet Dyer, Holding the Man, Jack Thompson, Last Cab to Darwin, Patrick Brammall, Peter Carey, Ray Lawrence, Robyn Nevin, Strangerland by Mark Roberts. Bookmark the permalink. I recently watched this film and loved it. Patrick Brammel is fantastic and this is a great contribution to the Australian film industry. Have you seen Nevin and Brammel in Upper Middle Bogan? Great show.